Peanut Butter Wolf, not Santa, is coming to town. 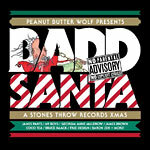 Laying it down with some old skool hip hop holiday joints, a choice Christmas funk cut from James Brown, and of course, it wouldn't be a true Stones Throw release without a few exclusive contributions from diverse artists on the roster such as James Pants, Georgia Anne Muldrow and Baron Zen. So whatever your celebrating, be it Christmas, Kwanzaa or Hanukkah, this is sure to be played all the way through to the New Year! Happy Holidays! Also a great holiday party idea!